Who was Joachim of Fiore? McGinn is a professor of Historical Theology and the History of Christianity at the Divinity School at the University of Chicago. Joachim of Fiore is the most important apocalyptic thinker of the whole medieval period, and maybe after the prophet John, the most important apocalyptic thinker in the history of Christianity. He's born in Calabria, some time about 1135, from what we would call a middle class family today. And he was an official in the court of the Norman kings of Sicily when he had a spiritual conversion, and went off on pilgrimage to the Holy Land, a mysterious time about which we know little. When he returned to Calabria, he lived as a hermit for a number of years before eventually joining the Cistercian Order. ... Joachim, like many 12th century monks, was fundamentally a scriptural commentator. And he tells us that he was trying to understand and write a commentary on the Book of Revelation, the Apocalypse, and finding it impossible. The book was too difficult. He couldn't figure out its symbolism. And he wrestled with this (he uses the term "wrestling" with it) for a number of months. ... He tells us that he had been stymied and given up the attempt to interpret the book. And then, one Easter morning, he awakened, but he awakened as a new person, having been given a spiritual understanding ("spiritualis intelligentia" is the Latin), a spiritual understanding of the meaning of the Book of Revelation and the concords (that is, the relationship of all the books in the Bible). And out of that moment of insight, then, Joachim launched into his long exposition on the Book of the Apocalypse, one of the most important commentaries ever written. Joachim's great insight about history is what is often called his view of the three statuses, or three eras of history. And it's fundamentally rooted in the Trinity. If Christians believe that God is three-fold (Father, Son, and Holy Spirit), Joachim then said that the Bible reveals that if the Old Testament was the time of the Father, the New Testament the time of the Son, there must be a coming third status or era of history that is ascribed to and special to the Holy Spirit, who gives the deep understanding of the meaning of both Old and New Testaments. And so Joachim returned to a more optimistic view of history, that after the crisis of the Antichrist (which he thought as imminent, as right around the corner in his own days), there would come a new era of the Church on earth, the contemplative utopia of the Holy Spirit, a monastic era of contemplation. That's the heart of Joachim's great vision and contribution to western apocalypticism. Like Hildegard of Bingen, Joachim is a great symbolist, a picture-thinker, in a sense. His writings, his Latin writings, are very complex and difficult to read. I'd call them opaque, actually. But he had a wonderful symbolic imagination. And so Joachim created figures, as he called them. ... The Book of Figures, which goes back to his own work but was added to by his disciples, is really the best way into Joachim's thought. So, for instance, when we talk about the three eras or the three statuses of history, it's very difficult to take this out of the texts themselves. But when we have the picture of the three interlocking circles, or when we have the image of what are called the "tree circles," where the two trees representing the Jewish people and the Gentile people grow together through the three ages of history, we get an immediate visual understanding of what Joachim is trying to convey in his often obscure writings. What is he trying to convey about the three stages? Joachim's view of history was deeply organic. And this is why he loves images of trees and flowering in order to present his message. So that there's no clear break or definitive fissure between the first status and the second status. The second status begins to germinate in the first. And the third status, the monastic utopia that I talked about, is germinating in the second status with the monastic life, beginning from Benedict, the founder of monks in the West. And another part then, I think, of the power of Joachim's view of history is its organic growing motif ... .
Joachim's view of the opposition between good and evil was, of course, central to him, as it is to any apocalyptic thinker. But Joachim wasn't into what we might call active apocalypticism, that one must take up arms against the forces of evil. Joachim felt that God controlled history, and that good would need to suffer, and the good would suffer indeed from the persecuting Antichrist, but that God would be the one who would destroy Antichrist and bring about this third status in history. So Joachim felt that the role model of the forces of good was that of the suffering, the persecuted, not of those who would take up arms against the beast of the apocalypse. How did this view differ from Augustine's? Apocalypse commentators for many centuries before Joachim had ruled out any attempt to use the apocalypse as a prophetic book, either about the history of the Church that was going on, or of future ages to come. That was, of course, something that Augustine had insisted upon; that the book can't be read in that literal fashion. Joachim broke with that, by finding in the images and symbols of the Book of the Apocalypse the whole history of the Church: the past, the present that he was living in, and the future to come. So he historicizes the book, in the sense that he ties it to actual historical events. This is what Augustine had ruled out. What signs did Joachim see? And what was his sense of the nearness? Joachim was a real apocalypticist in the original sense of the prophet John and others, because he believed the current events that he saw around him, particularly events connected with persecution of Christians, were signs of the times, signs that had been predicted in the Book of the Apocalypse and now were being fulfilled. This is what Augustine and others had ruled out, but Joachim felt was a part of Revelation itself. A good example of Joachim's reading the signs of the times would be his emphasis of the figure of Saladin, and Saladin's reconquest of Jerusalem in the year 1187. 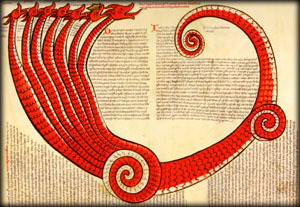 When Joachim comes to interpreting the 12th chapter of Revelation, he sees the seven-headed dragon as indicating seven heads of concrete historical persecutors through the course of history, and not just as a general symbol of evil. He identifies the sixth head with Saladin--he Islamic leader who reconquered the city of Jerusalem from the Crusaders in the year 1187--and sees him as immediately preceding the coming seventh head, who will be the Antichrist, the last and greatest persecutor of the second status of the Church. 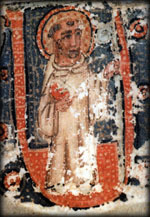 Joachim had an international reputation in the late 12th century. We know that he functioned as what I have called an apocalyptic advisor to a number of the popes of the 1180s and the 1190s. Despite living on a lonely mountaintop in his monastery in Calabria, the prophet's fame had spread very wide. And so it shouldn't surprise us that King Richard the Lion Hearted, when he's on his way to the Third Crusade and he has to spend the winter in Sicily (because of course you can't sail during the winter on the Mediterranean), when he stops there in Messina, he calls for Joachim, the famous prophet, and asks for his prophetic advice about what will happen. And Joachim travels to the palace there in Messina, in the winter of 1190-1191. And we have the accounts of his preaching to King Richard, and Richard's questions to him. What would somebody like Richard the Lion Heart ask Joachim? What kind of advice could Joachim give?